WilsonPro 70 Cell Phone Signal Boosters for up to 25,000 sq. ft.
Professional installation available - Contact us with details for a prompt installation quote. We stock all Wilson Electronics' Wilson Pro cell phone booster models. They are ready for pick-up at our Houston, Texas, Wilson Electronics' Wilson Pro products retail store. If WilsonPro's ordered by phone, we guarantee shipment by the next business day. Contact us to order at guaranteed best price + free bonus accessories whether purchased in-store, or by mail order. Being able to use a cell phone or tablet inside of a building is not a convenience any more. Mobile devices have become a crucial part of daily life and are essential in the workplace, making it important that every building has the best cell phone reception possible. 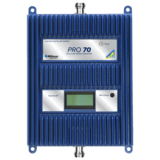 If your rental property, office building, commercial building or warehouse is not providing the absolute best cell phone reception, one of the Wilson Pro 70 Series commercial grade signal boosters can help solve the problem. WilsonPro boosters provide a maximum +70dB boost in signal strength inside of commercial buildings. This means that users will have more of those desired bars on their tablets and cell phones no matter where they are, inside of the building. As a result, instances of dropped calls and poor reception are drastically reduced, improving productivity in workplaces and providing convenience for mobile device users. - Single and multi-floor office buildings. - Warehouses and manufacturing facilities. - Hospitals and long-term care facilities. - Military and government buildings. - Utilities, including power plants and dams. With a Wilson Pro booster, mobile device users inside of an industry facility can receive signals from cell phone towers located up to twice the distance away. This greatly improves performance for talk, texting and Internet usage to improve experiences when using 2G, 3G and 4G LTE. 4. Wilson Pro Signal Boosters Provide Increased Support for Multiple Simultaneous Users. A Wilson Pro signal booster provides the greatest possible gains in uplink and downlink speeds, allowing more people to simultaneously use mobile devices within commercial spaces. Once the WilsonPro cellphone signal booster is installed, more users can utilize devices without noticing slowdowns. Some models even feature adjustable uplink and downlink speed functionality for each band, a feature that is highly desired in wireless boosters. This makes it possible to optimize performance for the exact needs of mobile device users. No matter what mobile service providers users choose, they can benefit from the wireless boosting technology of WilsonPro cell phone signal boosters. Wilson wireless signal boosters are compatible with service from all carriers in the U.S. and Canada and with 2G, 3G and 4G LTE networks. With more and more people now using their mobile devices to access the Internet, fast 4G LTE speeds are important in commercial buildings. A Wilson Pro cell phone signal booster dramatically increases the speed of Internet on tablets and smartphones with the gains it provides in signal strength, and uplink and downlink speeds. Although a WilsonPro 70 cell phone signal booster provides an unparalleled coverage area and the greatest gains in uplink and downlink speeds, the cost compared to the competition is minimal. In side by side comparisons, a Wilson Pro 70 booster offers the lowest cost per square foot for maximum return on investment than highly touted Distributed Antenna Systems (DAS). DAS are typically very expensive and large systems that tap directly into a cellular carrier's network and use a network of antennas to distribute the signal throughout inside of buildings. The cost of these systems run into hundreds of thousands and up to millions of dollars. Our commercial cell phone signal booster solutions consisting of Wilson Pro 70 signal boosters providing up to 25,000 square feet of coverage using a single unit, is a great alternative to a DAS installations because it will perform just as well and cost a fraction of the amount that a DAS set-up would cost. Installers love the Wilson Pro 70 boosters, as much as mobile device users do! These wireless signal boosters self-optimize during the installation process, greatly reducing the need for troubleshooting. Free training and support are provided for installers to ensure customer satisfaction and a seamless, hassle-free installation process the first time, every time. Every industrial Wilson Pro cellphone signal booster is FCC certified in USA, and certified by Industry Canada in Canada. This provides peace of mind that industrial or commercial Wilson Pro cell phone boosters are in line with all laws and regulations regarding the use of signal amplifier technology in U.S. and Canada. FCC & IC have determined that industrial signal boosters work, and are very effective if they pass all requirements and are certified. If you would like to read more details about this, please visit FCC's industrial boosters website or the part 90 boosters website (Part 90 signal booster is a type of industrial booster). Wilson has been a leading manufacturer of cell phone signal boosters for more than 20 years. Wilson Pro 70 Series repeaters or extenders are built upon the solid technology of Wilson Pro Quint amplifiers ("Quint" meaning boosting transmissions from five different frequency bands), their reputation for excellence is truly unmatched in the industry. That is why Wilson Pro & Wilson Pro Plus boosters are used by numerous Fortune 500 companies. 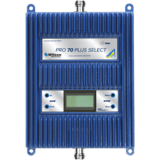 Choosing WilsonPro & WilsonPro Plus 70 Series cell phone signal boosters means getting the absolute best commercial grade cell phone boosters from a true industry leader. For example, the technology in the most recent Wilson Electronics Wilson Pro Professional signal booster 4000R kit, covers an incredible 100,000 to 140,000 square feet (WilsonPro 460131) using one single booster unit. Learn more about incredible technology within Wilson Pro 4000R cell phone signal booster. With Wilson Pro 70 signal amplifiers, your satisfaction is assured. WilsonPro cellphone boosters are backed by 60 days money-back satisfaction guarantee, so if you do not see the promised improvements in mobile device performance, you can get a full refund. In addition, Wilson Pro cellphone boosters are backed by 3 years manufacturer's warranty, and each kit comes with lifetime technical support. Purchasing kits from the Wilson Pro 70 Series means getting the best cell phone reception and true peace of mind. Enjoy Improved Cell Phone Reception with a Wilson Pro Cell Booster, Today! Wilson Pro cell booster series includes five different wireless booster units with options to meet the needs of every commercial setting. When you shop here at CellPhoneSignalBooster.us, you will get the benefits of our knowledgeable customer service team to help you decide which commercial Wilson cell phone booster model is right for your needs. You can chat with one of our customer service agents live by calling us at 800-501-3153, or chat using the Live Chat feature at our website, or fill out the form on our contact page to get help with choosing the right model. We will be glad to answer your questions and explain the differences between the wireless booster models. Wilson Pro Series amplifier kits are commercial grade. Wilson Pro 70 and Pro 70 Plus are for sale exclusively to Wilson certified installers. Learn the difference between 50 and 75 Ohm WilsonPro booster kits. Wilson Pro signal boosters offer this option to choose between both types of systems. We recommend 50 Ohm ones for its peak performance. However, you may opt for 75 Ohm ones if the wiring in your large establishment is pre-wired with 75 Ohm cables. The latter makes it a breeze to install and provides almost close to same performance.